The RC18x5 is a pre-wired GMDSS Console that meets all of the carriage requirements for ships navigating in Sea Area A1/A2/A3. This simple and reliable package consists of the FM8900S DSC-VHF/FM Radiotelephone, FS1575 MF/HF Radiotelephone/DSC Watch Receiver/Telex, Felcom18 Standard-C Satcom System (DF version includes dual Felcom packages), IB585 Terminal Unit and PP520 Printer. Because the RC18x5 comes as a pre-wired kit, it offers a flexible and space-saving solution which helps to minimize installation time on both existing vessels and new builds. The FELCOM19 is an Inmarsat MINI-C Mobile Earth Station terminal, compatibile with LRIT applications. It features SSAS capability with optional SSAS alert units. A wide variety of communication schemes available, including telex, FAX, e-mail, EGC (non-GMDSS), and Data reporting/polling. A GPS receiver is incorporated, and its black-box configuration allows for flexible installation. The FELCOM18 is FURUNO's new Inmarsat-C Mobile Earth Station. It provides a high quality two-way telex and data link between ships and other parties at sea or on land. All functions and services of the Inmarsat-C system are provided: EGC (Safety NET/FleetNET), distress message handling, two-way digital store-and-forward messaging including polling, data reporting, E-mail, etc. Distress alert are initiated by the remote distress alert unit. The distress message including own ship's position is easily edited. A PC can be used for editing the message via Ethernet when it is supplied with dedicated software. The Furuno FM8900S is a Semi-duplex 25-Watt VHF Radiotelephone with a built-in Class-A DSC and CH70 watch Receiver. It features an easy-to-read, high-contrast 4.3" bright color LCD, enhanced noise reduction and speaker for superb voice quality, and quick-access CH16 key. Channel selection is simplified with the inclusion of both a rotary control and direct keypad input. Automatic entry of own ship position and time is accomplished through interfaced GPS receiver. The FM8900S can also connect to an office or home via an existing PSTN (Public Switched Telephone Network). The FM8900S scans all channels in the selected region as well as watches CH16 in alternate shifts.In the menu, all tasks are assigned numbers, and the operator can access each of the menu items either by turning and pressing PUSH TO ENTER knob or simply pressing the corresponding numbers on the numeric keypad for simplified operation. It features a Replay function that records the latest 120 seconds of incoming communication on the currently set channel. By simply pressing the “REPLAY” button on the numeric keypad, the last-received message will be played back on the spot. The FM8900S fully meets GMDSS carriage requirements for SOLAS ships, as well as new ITU recommendation on digital selective calling system for use in the Maritime Mobile Service, ITU-R M.493-13. ATIS signal transmission is available for inland waterways. The 150 Watt FS1575 is a reliable MF/HF Radiotelephone for general and distress communications with integrated DSC/DSC Watch Receiver. It facilitates both general and GMDSS communication, operating as a DSC transceiver and as a DSC Watch Receiver on all distress and safety frequencies in MF and HF bands. An optional IB585 NBDP terminal can be connected to the transceiver unit for maritime telex operation and distress message/maritime safety information handling. It features a bright, high-contrast 4.3" color LCD (480x272 pixels). Multiple display configurations are available, as well as a Night Mode (white text on black background display) for wheelhouse operation. Instant selection of 256 user-specified channels is provided with a rotary knob or direct keypad input. Quick access to DSC message composition is available by dedicated keys on the control unit. The FS1575 fully meets GMDSS carriage requirements for SOLAS ships operating in A3 and A4 sea areas, as well as ITU recommendation on digital selective calling system for use in the Maritime Mobile Service, ITU-R M.493-13. The IB585 is a 10.4" color LCD display for use with RC1800 series GMDSS consoles. The IB585 displays messages at 72 characters/line with 25 lines/screen. File management, text editor and utility programs ensure easy operation. The terminal also comes with a disk drive. 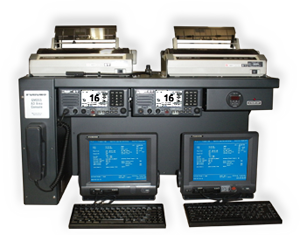 The PP520 is a GMDSS compliant dot matrix printer. It prints navigation information fed from the ship's radio communications system. The RC1815 consists of 2 each FM8900S and 2 each PP520. All other items listed are supplied in quantity of 1 each. GMDSS Console, Less Equipment. Not available for sale as a standalone item. Inmarsat-C Ship Earth Station terminal for GMDSS applications. Full GMDSS compliance with optional printer and AC/DC power supply. Full Function, Waterproof Remote Handset with Display, FM8900.